All roads led to Egbeda Comprehensive High School, Ibogun on Sunday 10TH OF December, 2017, as prominent Ogun Ifa Priest, Ifakayode Faluade, was crowned Oba of Ibogunland. The son of the late Anikinnikun and Ilufemiloye 1st was more than happy to see a large turnout of guests, who came to share in his joy. City People’s Assistant Society Editor, ABIOLA ORISILE, was at Ibogun to serve you hot gists. Ibogunland is few minutes’ drive from Iyana-Coker in Ifo, it is an Owu settlement founded by a group of Owu hunters from Abeokuta towards the end of the Nineteenth Century. However, Ibogun has developed to accommodate other groups of people such as Egbas, Aworis, Eguns among others. And over they years the town has experienced some level of development as it now boasts of electricity, motorable roads, portable water supply etc. It has also become more popular in political landscape of Nigeria and some prominent people who hail from the town has made it popular. They include former President Chief Olusegun Obasanjo, His Majesty, Oba Adesanya Dosunmu, the Olowu of Owu Kingdom, Chief Ogooluwa Bankole, CEO of Premier Lotto boss, the late Fela Anikulapo Kuti, also hailed from there and Chief Ayoka Adebayo, a former INEC Commissioner Ekiti State, to mention few. Ogun State Commissioner for Chieftaincy Affairs and Local government, Hon Jide Ojuko came in a few minutes past 2 pm not only to perform his obligation, but also to also bring the good will message of the Governor, Senator Ibikunle Amosun. Hon Ojuko, who came into the venue few minutes past 2pm, spoke well of the new Kabiyesi, saying he could also refer to him as an Awori boy, as he grew up in Ota. He later presented the staff of office to him a few minutes past 3pm. During the presentation of Staff of Office to Oba Kayode Faluade, Hon Jide Ojuko, revealed to that Kabiyesi’s joy should know no bounds as he was crowned. He explained that there allegation that Senator Ibikunle Amosun was only crowning Owu kings. He denied the allegation. He said that as he was speaking to the guests, there were over 250 letters of Obas requesting confirmation from the Governor they will do everything to make sure that they do the needful. A few minutes past 4pm, a black SUV drove into the premises and it was Oba Olusanya Adegboyega Dosumu, the Olowu of Owu Kingdom. Although he didn’t witness the presentation of staff of office but he spent many hours with Oba Ifakayode before he left. So also was prominent Ifa Priest, Ifayemi Elebuibon, who was is very close to Oba Ifakayode even before he became King. He was the one who did the ‘Iwure‘ and declared the event open. Ask at Ota about Oba Ifakayode‘s Father, Anikinnikun, and you would be told he was one of the most trustworthy Ifa Priest in Ota. He was said to be very popular because of his uprightness and which made people come from far and wide to seek divination from Ifa through him. It was revealed that he didn’t use cowries, He would only look at your palm and speak. It was also revealed that Anikinnikun was able to warm himself into the hearts of many because of his goodwill Oba Ifakayode learnt the rudiments of Ifa and his children are also learning the art Ifa divination from him. If there is anybody who was happy at Oba Ifakayode’s coronation, it was Oba Abdul Fati Akamo and Fuji King, Wasiu Ayinde Marshal. This was revealed in a short interview at the coronation. According to Olu Itori, he revealed that he was adopted by the new Kabiyesi’s father, Anikinikun, many years ago when he was running his traveling agency, he explained that Kayode’s father was a very powerful herbalist and he was very popular in Ogun. He added that before Ifakayode‘s father‘s death, Kabiyesi gave Ifakayode to him and said, he is your brother, nurture him and he has known the new Kabiyesi for over 20years. Another person who couldn’t contain his joy was Fuji Czar, King Wasiu Ayinde Marshal, who explained that Oba Ifakayode was the best choice for the stool. He said that he has known Kabiyesi for close to 20years and he could say he is fit and worthy to be crowned. Chief Olusegun Obasanjo and Deputy Governor of Ogun State, Mrs Yetunde Onanuga, were not at the event, but their contribution was felt. Don’t forget that OBJ, the Balogun of Owu Kingdom, also has his roots in Ibogun. Oba Ifakayode explained that he played a major role in ensuring his installation as Oba. So, also was the Depurty Governor of Ogun State, Mrs. Yetunde Onanuga. Her contribution to the approval of Kabiyesi choice was also appreciated. Oba Ifakayode and his ebony pretty wife, Oloori Amoke, were among early callers at the coronation. They came in as early as 11am and waited for the arrival of the Governor. Those, who know Kabiyesi well said he is a punctual person. He spotted a white flowing aso-oke matched with coral beads with pure 18 carat gold stopper. 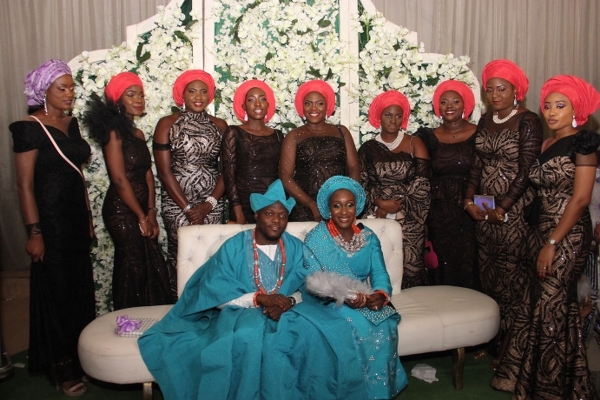 His wife of over 25years, Oloori Amope, also spotted a special white aso-oke, frilled with quality gold jewellery. Her second appearance was in Orange skirt and blouses, which sat well on her curvy body. Her husband also complemented her by adoring a white special lace. Oba Lamidi Adeyemi, the Alaafin of Oyo couldn’t make the event but he was repesented by his first daughter, Arewa Omoba Folasade Adeyemi. She was one of the early callers at the event. So, also was Ooni of Ife, His imperial Majesty, Oba Adeyeye Enitan. He sent His High Chief, Sarun Oriowo Oyeyemi. Sarun is the closest Chief to Ooni of Ife. He was at the event with Prince Adebayo Ogunwusi. Maritime top shot, Princess Toyin Kolade, was all out to support Oba Ifakayode Faluade. She came in a few minutes past 5pm, looking royal in a white buba and iro. As expected, she matched it with a 18carat gold. Her open toes silver Italian shoe and bag dazzled as she walked in. She was one of the celebrities who had no hidden place at the event. She came with exotic expensive wine, which was freely shared guests. 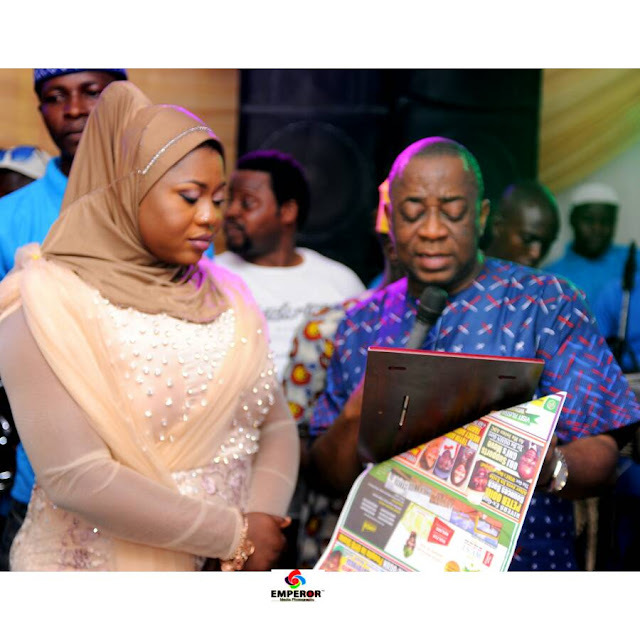 Ashabi Saranda, the pretty wife of Ogun businessman and one of the major players in Quarry business, Otunba Wale Saranda and her friend, Oloori Barakat Akamo and Erelu Folasade Animashaun were among celebrity friends, who made fashion statement at the event. Though, they sew the orange lace into simple iro and buba, but their choice of jewellery made many tongues wag. They adorned their attires with the best of gold and diamond. Their Italian shoes and purse was also orange as they enjoyed the event. Don’t forget that they became close through their husbands and they have been friends for over 15years. They all came with their darling husband. Popular Ogun Big Boy, Dende, was the one who led his clique of friends, Inumidun Caucus . They spotted white flowing agbada. They were among those who made naira rain at the event. There was an array of prominent Nigerians at the event. Among many sighted were: Oloori Oluwo, Alhaji Lamex, Chief Francis Meshioye and Wife, Ganiyat Oloro(Yeye Biye of Meranland, Dr Muyiwa Olaleye, Hon Olarenwaju Bello, Hon Olujuwon Gbadebo, Mr Simeon, Oba Theophilus Koleosun, Oba Rafiu Ajayi, Oba T.O Afolabi, Oba Tajudeen Osungboye, Oba Elejio, Alhaji Sikiru Atobatele, Hon Sola Onifade, Olufemi Sodeinde, Mrs Oreleyin, Tokaz Hotel boss, Dr Ogundimu Abiodun, Baskelly, Prince Adebayo, Chief Oriowo Oyeyemi, Oba Eselu Kingdom, Oba Kolawole and Olori Toyin Sowemimo, Remilekun Akamo, Sunday Ibadan, Kamoru Yusuf, Engineer Lukman, Dudu Taofeek, Alhja Ejide Socopao, Alhaja Yetunde Abass, Alhaja Silifat Werewere, Erelu Akeronke Ijale, Yeye Oba Alake Oshin, Yeye Bbaab Oba, Kudirat Awopeju and a host of others.